UFO SIGHTINGS DAILY: Giant UFO Seen On Live Cam Over Hessdalen, Norway On Sept 26, 2016, Video, UFO Sighting News. Giant UFO Seen On Live Cam Over Hessdalen, Norway On Sept 26, 2016, Video, UFO Sighting News. Streetcap1 caught this light as it rides the edge of a giant disk hidden in the cloud. Hessdalen is a small valley in the central part of Norway. Ever since 1981 residents of the Valley have been concerned and alarmed about strange, unexplained lights that appeared at many locations in the sky. Since then, thousands of lights were observed, but the Norway Gov refuses to investigate, probably due to them having an agreement with the aliens. Hessdalen is home to an alien base 3-5km deep below the surface, and they are sometimes seen during their exit and entrance into this base. 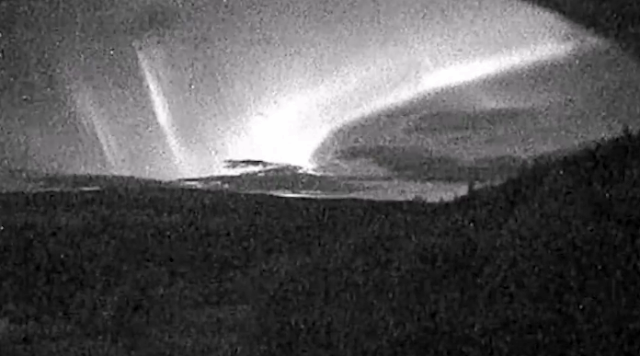 I thought these were the Northern Lights at first, maybe they are, but we are looking West from the webcam. I checked about a half hour later and there were no lights, just clear sky. I will link this so you can check live for yourselves and maybe catch something interesting. Streetcap1.